Quad City is the third-busiest commercial airport in Illinois behind Chicago's O'Hare and Midway International Airports. The international designation is for being an official port of entry and having a U.S. customs port of entry. A Foreign Trade Zone and U.S. Customs Office are located at the airport, enabling international inbound and outbound shipments. There are no commercial passenger flights to or from any international locations, but some private aircraft (e.g., those owned by Deere & Company) do make non-stop, international flights. Franing Field, the site of the present Quad City International Airport, was picked as an ideal flying field, with 120 acres (49 ha) of level, grassy land free of obstacles. The airport made headlines right at the start, chosen as a control point for the first coast-to-coast flight in the fall of 1919. On August 18, 1927 an estimated 10,000 people came to welcome Charles Lindbergh in Moline and his famous plane, the Spirit of St. Louis on the Gugenheim tour, a cross-country commercial aviation promotion tour. In 1929 Phoebe Omlie set an altitude record above the airport in a Velie Monocoupe, the only plane ever manufactured in Moline, which still hangs in the passenger terminal. In 1947 the Metropolitan Airport Authority of Rock Island County was formed after seven townships voted to establish it. In 1957 the first count of enplaning and deplaning passengers was made with a total of 59,701 recorded. The airport underwent major remodeling in 1961 and 1968, adding everything from baggage claim to a restaurant and boarding areas. The present airport terminal was completed in 1985, after studies showed that an addition to the 1954 structure would be more costly than an entirely new terminal. The shift to the new $11 million terminal allowed expansion of airline facilities; between 1979 and 1986, the number of airlines increased from two to seven. AccessAir, Air Midwest, AirTran Airways, America West Airlines, American Airlines, Allegiant Air, Chicago Air, Midway Connection, Northwest Airlines, Ozark Air Lines, Pan American World Airways, Skyway Airlines, Trans World Airlines and United Airlines have flown to Quad Cities. At one time Mississippi Valley Airlines had its headquarters at the airport. In the early and mid-1990s turboprop equipment was common; Northwest Airlink and other airlines had Saab 340Bs. Carriers have replaced their turboprops with newer regional jets. Allegiant Air MD 80s fly to Orlando, Las Vegas, Clearwater, and Phoenix/Mesa. United Boeing 727s and 737s flew non-stop to Denver until 1995; United flights to Moline began in the 1930s. Republic DC-9s flew to both Detroit and Minneapolis starting in 1986; successor Northwest pulled out in 1989. America West 737s flew to Phoenix in 1987-92, and Braniff served Moline from the 1940s until 1959. In 2001 the terminal underwent a major renovation and expansion: two new concourses, a larger baggage claim area, new restaurants and gift shops. The project doubled the size of the terminal. The Philadelphia architectural firm DPK&A designed the new concourses. A larger U.S. Customs and Border Protection Facility was opened in 2014 in a former air cargo building. The facility processes international passengers arriving on general aviation flights. No airlines use this facility. It has a processing room, an interview room, space for agricultural inspections, office space, and holding cells for passengers who are prohibited from entering the U.S. or who are being detained and transported by law enforcement. Phase two of the project will renovate the remainder of the building to create an international terminal or Federal Inspection Service, should the airport establish nonstop international charter flights. Gere-Dismer Architects of Rock Island designed the facility. The airport set its passenger record in 2007 when 484,212 passengers boarded flights while 481,930 deplaned. The total beat the record of 911,522 set the previous year. In 2008 passenger numbers declined: 957,087 passengers enplaned or deplaned. Passenger count dropped to 763,416 in 2013. Quad City International Airport can accommodate any aircraft in almost any weather with the long runways, ILS, and high-intensity lighting. Airport officials claim that the airport is possibly capable of handling the Airbus A380. The airfield has had many changes over the past few years, including extending Taxiway Hotel. Runway 5/23 has been expanded to a usable 5,015 feet (1,529 m). Runway 9/27, the longest runway, was rebuilt in 2011. The program included a temporary 6,500-foot (2,000 m) parallel runway (10/28); now taxiway P. The new runway 9/27 has new pavement, new shoulder construction, taxiway additions, and a new glide-slope capture effect kit for runway 9. The cost was $34 million and was completed in late 2012 when the temporary runway became a taxiway. The airport's first Air Traffic Control Tower was on top of the old (1954-era) passenger terminal. The present tower, on the south side of the airport near fixed-base operator Elliot Aviation, is manned seven days a week from 0530 am to 1030 pm. At other times control of airspace is by the Chicago Air Traffic Center remoted from Aurora, Il. In 2017 the airport had 31,427 aircraft operations, average 86 per day: 51% general aviation, 29% air taxi, 18% airline and 2% military. In December 2017, 85 aircraft were based at the airport: 55 single-engine, 18 multi-engine, 11 jet and 1 helicopter. The airport is designated international for having a port of entry customs service. A Foreign Trade Zone and U.S. Customs Office are located at the airport, enabling international inbound and outbound shipments. The Customs & Border Protection offices recently opened in the easternmost former cargo building. There are three cargo facilities for every available ramp and the airport has expansion capabilities. A number of air freight companies are located at the airport including BAX Global, DHL, and UPS Supply Chain Solutions. Fixed-base operators (FBO's) include Elliott Aviation. The terminal features the full-service Air Host Restaurant. There is also a full-service bar, Paradies Gift Shop, shoe shine service, and post office boxes and a mail drop. An art gallery, featuring local and regional modern and contemporary art, is located near the security check point. There is also a visitor information center near baggage claim to provide passengers local tourism information and directions. Free wireless internet (Wi-Fi) is available throughout the airport. Beyond the security checkpoint in between Concourses A & B, there is a snack bar, lounge, bar, and a Gevalia Kaffe Coffee Shop. Located on Concourse B is a CNBC News and Gift Shop. Destination Points, a frequent flyer lounge, is available for local and regional travelers who fly approximately eight or more times, annually. There are also several work stations that passengers may utilize to set out their computers or work, and recharge their electronics. There are two hotels on the airport property across the parking lot from the terminal. A three-story Hampton Inn & Suites opened in 2006 and a four-story Holiday Inn Express in 2014. In an effort to decrease the number of people circling the airport proper waiting to pick up arriving passengers a cell phone waiting area was created in 2008 adjacent to the airport's entrance road. A consolidated rental car facility opened in October, 2014. The airport has a TSA office, serving administrative functions for Downstate IL airports, on the second floor of the terminal. ^ a b c d FAA Airport Master Record for MLI (Form 5010 PDF), effective January 5, 2017. ^ Jennifer DeWitt (May 24, 2012). "Quad-City Airport named state's airport of the year". Quad-City Times. Retrieved June 23, 2012. ^ By enplanements the FAA ranks Chicago O'Hare as the No. 2 airport in the United States, Chicago–Midway is No. 26, Quad City International is No. 130, General Downing – Peoria International is No. 154, and Central Illinois Airport is #164. "Enplanements at All Commercial Service Airports (by Rank) – Preliminary" (PDF). Federal Aviation Administration. Archived from the original (PDF) on September 3, 2013. Retrieved August 5, 2012. ^ Sarah Hayes (1999). "A Q-C Century – Progress 99: A brief history of the Quad City Airport". The Dispatch / The Rock Island Argus. Retrieved June 23, 2012. ^ "World Airline Directory." Flight International. March 30, 1985. 98. "Head Office: PO Box 949, Quad City Airport, Moline, Illinois 61265, USA." ^ Jennifer DeWitt (April 22, 2014). "New customs facility opens at Q-C airport". Quad-City Times. Retrieved April 23, 2014. ^ Jennifer DeWitt (January 15, 2008). "QCIA sets passenger record for 2007". Quad-City Times. Retrieved May 13, 2012. ^ Jennifer DeWitt (January 21, 2008). "Q-C airport misses annual passenger record by 1 percent". Quad-City Times. Retrieved May 13, 2012. ^ Jennifer DeWitt (January 30, 2014). "Q-C International ends 2013 with slight passenger decline". Quad-City Times. Retrieved April 23, 2014. ^ Jennifer DeWitt (November 6, 2011). "Runway project nears completion". Quad-City Times. Retrieved June 23, 2012. ^ "Features". Quad City Airport. Retrieved June 24, 2012. ^ Kay Luna (November 29, 2006). "New airport hotel opens in Moline". Quad-City Times. Retrieved June 23, 2012. ^ Jennifer DeWitt (June 18, 2014). "Frontier opens Holiday Inn Express in Moline". Quad-City Times. Retrieved June 18, 2014. ^ Jennifer DeWitt (November 24, 2008). "Q-C airport rings in new service with cell phone lot". Quad-City Times. Retrieved June 23, 2012. ^ "Moline, IL: Quad City International (MLI)". Research and Innovative Technology Administration. Retrieved March 16, 2016. Wikimedia Commons has media related to Quad City International Airport. Gerald R. Ford International Airport is a commercial airport in Cascade Township approximately 13 miles (21 km) southeast of Grand Rapids, Michigan. The facility is owned by the Kent County Board of Commissioners and managed by an independent authority. The Federal Aviation Administration (FAA) National Plan of Integrated Airport Systems for 2017–2021 categorized it as a small hub primary commercial service facility. 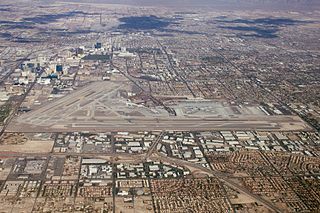 McCarran International Airport is the primary commercial airport serving the Las Vegas Valley, a major metropolitan area in the U.S. state of Nevada. It is in Paradise, about 5 miles (8.0 km) south of Downtown Las Vegas. 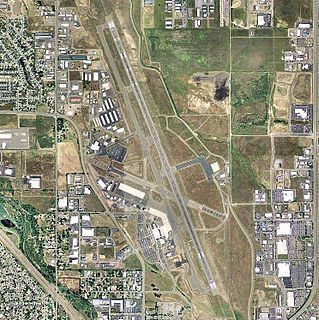 The airport is owned by Clark County and operated by the Clark County Department of Aviation. It is named after the late U.S. Senator Pat McCarran, a member of the Democratic Party who contributed to the development of aviation both in Las Vegas and on a national scale. LAS covers 2,800 acres (11.3 km2) of land. Northwest Arkansas Regional Airport is in Northwest Arkansas in Highfill, Arkansas, 15 nautical miles northwest of Fayetteville and 10 nautical miles northwest of Springdale. It is often referred to by its IATA code, which is incorporated in the airport's logo as "Fly XNA". 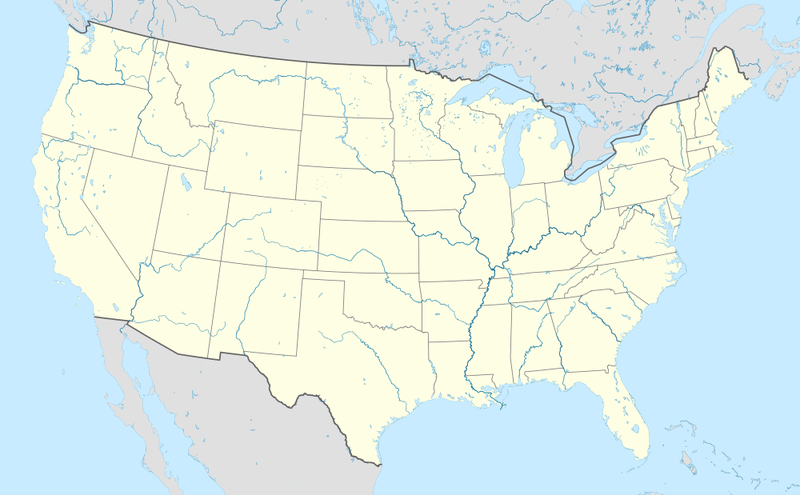 Southwest Florida International Airport is a major county-owned airport in the South Fort Myers region of unincorporated Lee County, Florida, United States. The airport serves the Southwest Florida region, including the Cape Coral-Fort Myers, Naples-Marco Island, and Punta Gorda metropolitan areas, and is a U.S. Customs and Border Protection port of entry. It currently is the second-busiest single-runway airport in the United States, after San Diego International Airport, although a second runway is expected to open by 2020. In 2018, the airport served 9,373,178 passengers. Will Rogers World Airport, a.k.a. Will Rogers Airport or simply Will Rogers, is an American passenger airport in Oklahoma City located about 6 miles (8 km) Southwest of downtown Oklahoma City. It is a civil-military airport on 8,081 acres of land. Although the official IATA and ICAO airport codes for Will Rogers World Airport are OKC and KOKC, it is common practice to refer to it as "WRWA" or "Will Rogers". McGhee Tyson Airport is a public/military airport 12 miles south of Knoxville, in Alcoa, Blount County, Tennessee. It is named for United States Navy pilot Charles McGhee Tyson, lost on patrol in World War I.
Birmingham–Shuttlesworth International Airport, formerly Birmingham Municipal Airport and later Birmingham International Airport, is a civil-military airport serving Birmingham, Alabama and its metropolitan area, including Tuscaloosa. It is in Jefferson County, five miles northeast of downtown Birmingham, near the interchange of Interstates 20 and 59. Piedmont Triad International Airport is an airport located in the center of North Carolina just west of Greensboro, serving the Piedmont Triad region of Greensboro, High Point and Winston-Salem as well as the entire Piedmont Triad region in North Carolina. The airport, located just off Bryan Boulevard, sits on a 3,770 acre campus and has 3 runways. Piedmont Triad International airport is the third busiest airport in North Carolina averaging 280 takeoffs and landings each day. PTI is owned and operated by the Piedmont Triad Airport Authority. Gary/Chicago International Airport is a joint civil-military public airport in Gary, in Lake County, Indiana, United States. It is three miles northwest of the city center of Gary, and 25 miles (40 km) southeast of the Chicago Loop. It is operated by the Gary/Chicago International Airport Authority, the basis for which was formed by the Chicago Gary Airport Compact signed in 1995. Nearby highway connections include I-90, I-80, I-94, I-65 and the Chicago Skyway. Des Moines International Airport is a civil-military airport three miles southwest of Des Moines, in Polk County, Iowa. It has 21 connections to major airline hubs. Bishop International Airport is a commercial and general aviation airport located in Flint, Michigan. It is named after banker and General Motors board member Arthur Giles Bishop, who donated 220 acres of his farmland for the airport in 1928. The third busiest airport in Michigan after Detroit and Grand Rapids, it surpassed competitor MBS International Airport in terms of airline operations in 2002. In 2007, 1,071,238 passengers used Bishop International Airport; in 2011, 938,914 passengers used the airport. It is included in the Federal Aviation Administration (FAA) National Plan of Integrated Airport Systems for 2017–2021, in which it is categorized as a small hub primary commercial service facility. Fayetteville Regional Airport, also known as Grannis Field, is a public use airport in Cumberland County, North Carolina, United States. It is owned by the city of Fayetteville and located three nautical miles (6 km) south of its central business district. 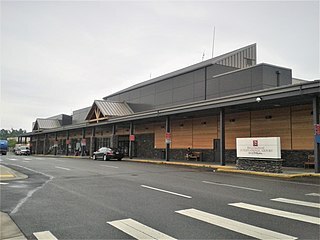 Bellingham International Airport is three miles (5 km) northwest of Bellingham, in Whatcom County, Washington, and the third-largest commercial airport in Washington. BLI covers 2,190 acres of land. MidAmerica St. Louis Airport is a public use airport located adjacent to Scott Air Force Base. It is located 14 nautical miles east of the central business district of Belleville and 18 nautical miles east of downtown St. Louis in St. Clair County, Illinois, United States. South Bend International Airport is three miles northwest of South Bend, in St. Joseph County, Indiana, United States. It is the state's third busiest airport in terms of passenger traffic after Indianapolis International Airport and Fort Wayne International Airport. Phoenix–Mesa Gateway Airport, formerly Williams Gateway Airport (1994–2008) and Williams Air Force Base (1941–1993), is an international airport in the southeastern area of Mesa, Arizona, and 20 miles (17 nmi) southeast of Phoenix, in Maricopa County, Arizona. The airport is owned and operated by the Phoenix–Mesa Gateway Airport Authority, and is a reliever airport for Phoenix Sky Harbor International Airport. It is a base for Allegiant Air. The airport authority is governed by a six-member board: the mayors of the towns of Gilbert and Queen Creek, the mayors of the cities of Mesa, Phoenix, and Apache Junction, and the tribal governor of the Gila River Indian Community. Hagerstown Regional Airport, also known as Richard A. Henson Field, is a county-owned public-use airport in Washington County, Maryland, United States. It is located four nautical miles north of the central business district of Hagerstown, Maryland, about a half mile from the Maryland/Pennsylvania border. The airport is in Western Maryland off Interstate 81 at exit 10 and U.S. Route 11, not far from Northern Virginia, South Central Pennsylvania, and the Eastern Panhandle of West Virginia.